Today I am sharing a cleaning tip that I have used for years. So many years that I can’t even remember who gave me the idea. That was back before I even blogged, before anyone blogged really. How did we survive? 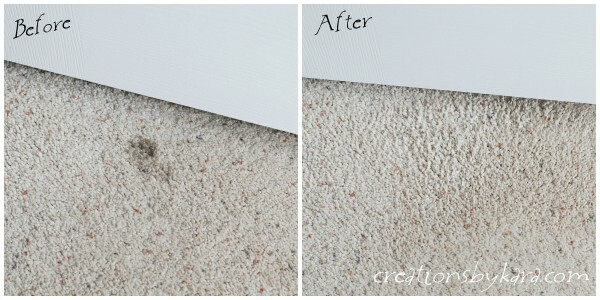 Are you ready to hear the cheapest and easiest way to get rid of spots on your carpet? Yep, you heard me right. Shaving cream. When I first heard about it, I was skeptical, so I put it to the test against several spray spot carpet cleaners on the market. 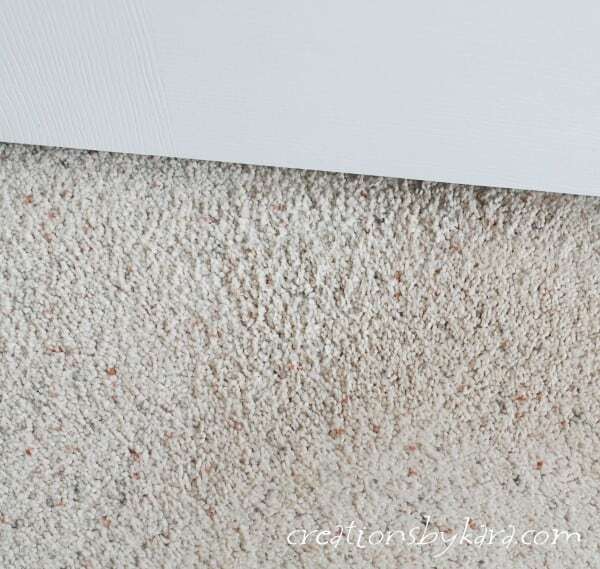 Not only does it remove spots just as well, but it doesn’t leave the carpet feeling “crunchy” like most of them do. This morning I tried it out on a spot on the carpet between my master bedroom and bathroom. I’m embarrassed to admit this, but it’s been there for months. As an upside, now you know that this will work even with carpet stains that have been neglected because you’re too busy doing other things like feeding people, providing them with clean clothes, and running them all over tarnation. I just dabbed a bit of shaving cream on it. The cheapest shaving cream works the best. You don’t want the fancy kinds with the lotion. Just work it in a little bit with your fingers. Let it sit for a minute or two. Then just wipe it up with a wet cloth. (If you have light carpet, use a light colored cloth.) Voila, spot GONE! And when it dries, it won’t be all stiff and crunchy to walk on. Best carpet spot remover ever! Clean carpets are the best carpets. And this carpet cleaner is the best! Wow. Shaving cream as a carpet cleaner? Do you find that cheap brands work well or is there a brand you always use for consistent results? I usually buy the cheap men’s brand. As long as it doesn’t contain lotion, it should work. This looks great! Unfortunately, I’ve used a cleaning spray for my dog’s messes on our couch (he went through a marking phase) and have ended up with quite a few noticeable water stains. Oh man, that stinks (literally)! I’ve never tried shaving cream on water stains, but it’s certainly worth a try. You did a great job removing that stain. Your carpet looks great. You would never know there was a stain to begin with. I love multipurpose products. Shaving cream wins the day. Also, the fact that the cheapest shaving cream works best really says something. For those looking to save a buck, this post will be especially useful. This is a really great tip that anyone can use! I had never heard this one before but I’m definitely going to give it a shot. I’ve got plenty of shaving cream lying around. Thanks for sharing! You just saved a lot of homeowners a considerable amount of money with this ingenious tip. And to think you’ve known about it since way before you started blogging, too… Very handy. 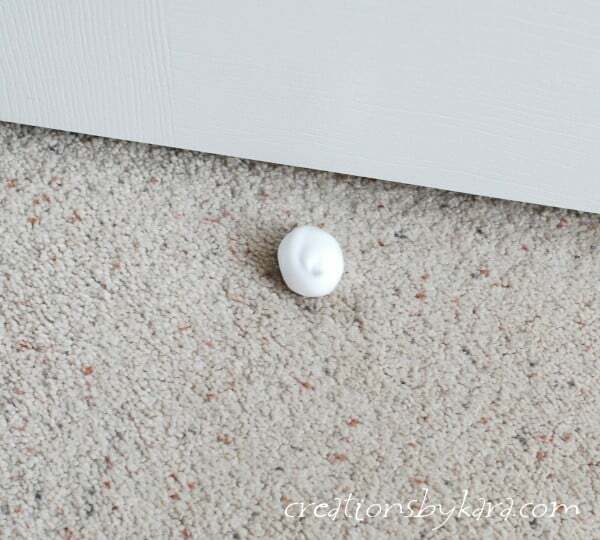 I didn’t know that shaving creams can work such wonders to remove stains from your carpets. My rug has got some really stubborn stains on it that I find difficult to remove. I am surely going to try your technique. 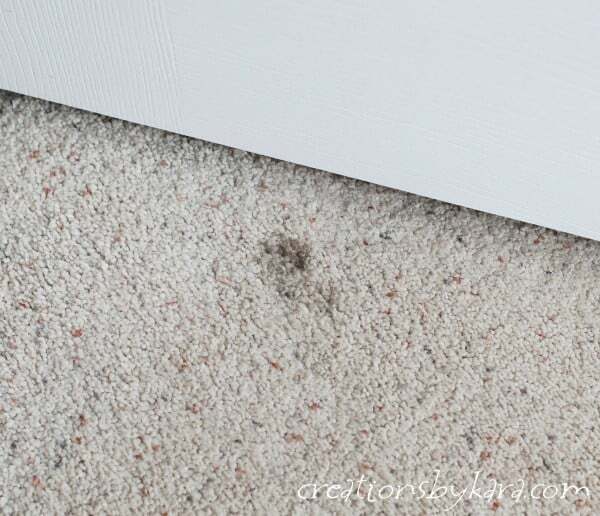 Having stains on your rug can really put a damper on the cleanliness feel to your home. I am glad to know that there are easy and effective ways to clean stains. The technique that you used to keep your carpets seems very effective! Thanks you for sharing! 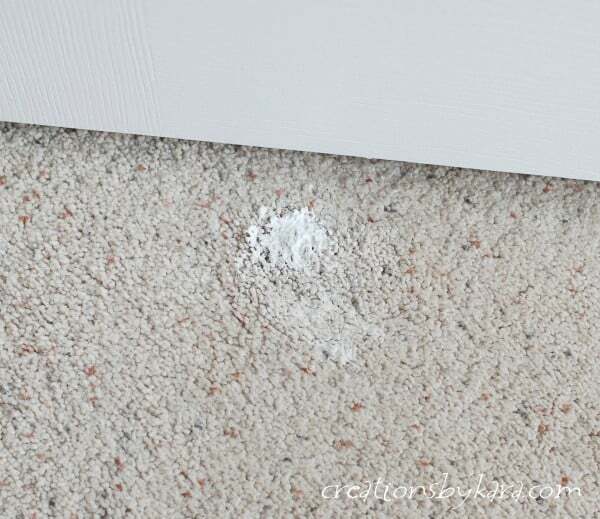 Thanks for the tip to use shaving cream to remove carpet stains. I agree that it’s an inexpensive way to get the job done. I also think it simplifies the process. OH my gosh I am definitely trying this. I have a HUGE spot on my carpet that has been there for over a year. I can’t get it up at all. I’m going to try this and see if it does anything, I’m up for anything at this point! I didn’t know shaving cream can do that! That was awesome! 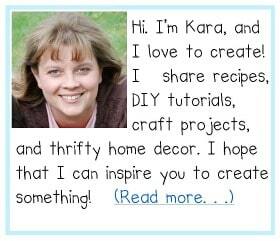 Nice post Kara! Wow, I had no idea that shaving cream could be so effective in keeping your carpet stain free. It might be a good idea for me to try this out some time soon on my own carpet. However, if this shaving cream trick doesn’t work, then I think I’ll call a professional. It isn’t worth it to leave the stains for too long! Great tip! Not a lot of people would think of using shaving cream to clean up stains. I was so excited to try this on some old greyish mystery stains in our new house. I think I may have used too generous of an amount of shaving cream( as suggested Barbasol sensitive) or maybe worked it into the carpet too much. I can’t tell if they stain is gone, but I now have a very white spot over the treated areas. =( despite rinsing with white rags and water- it’s not coming out. Hopefully as time passes it will fade. So beware hopeful readers of using too much or working it in too well! Thank you! I tried it on three spots and it cleaned them all beautiful. I use Barbasol, and I usually get the kind for sensitive skin because I figure it’s least likely to contain any lotion or funky scents. Shaving cream?! Seriously?? That is awesome. I need to use this immediately. Isn’t it great when the simple things work?! OH my gosh I am definitely trying this. I have a HUGE spot on my carpet that has been there for over a year. I can’t get it up AT ALL. It even came back when we had our carpets professionally cleaned, and it’s driving me nuts. I’m going to try this and see if it does anything, I’m up for anything at this point! Let me know how it works Taryn! If it works that well on old stains, I’ve got to try it. We have some ridiculous stains I’d just about given up on. Thanks for the tip!